A. P. Matthaiou and N. Papazarkadas (edd. 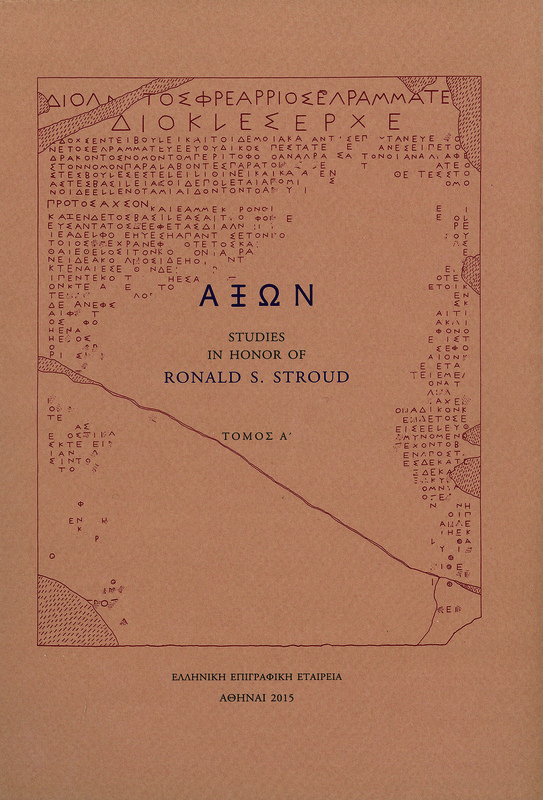 ), ΑΞΩΝ: Studies in Honor of Ronald S. Stroud (Athens: Greek Epigraphic Society 2015). The Festschrift was presented to the honorand at Berkeley on the occasion of the 2nd North American Congress of Greek and Latin Epigraphy on January 5, 2016. It brings together several of Ron’s friends, colleagues, and students with articles on the epigraphy and historical topography of Athens and Attica, the Peloponnese, and the wider Greek world. G. E. Malouchou: Τῶν σκηνῶν καὶ τῶν ἐδαφῶν: Νέα ἀττικὴ ἐπιγραφὴ τοῦ 4ου αἰ. π.Χ. A. P. Matthaiou: Τρία Ἀττικὰ ψηφίσματα τοῦ 5ου αἰ. π.Χ. This entry was posted in publications and tagged Athens, Greek Epigraphic Society, Greek Epigraphy, New inscriptions, Peloponnese. Bookmark the permalink.